Excuses, procrastination and plain dislike create roadblocks to our goals. These reasons are often why we don’t do what we know we should do. But there’s another even more important reason-motivation. As we explore this month’s theme of execution in our #MemoryMakover, it’s important to look at the why behind the what. So far, we’ve explored our memory wellness goals, organized, and identified the importance of just do it. These are all key elements, but the final and most crucial component in any action is its underlying motivation. The foundation of motivation is-do we actually WANT to do whatever it is we’re supposed to? If the answer is yes, motivation and actions flow. But if the answer is no, we need to dig deeper to find our motivation. When I look at my own, friends’, family, or clients’ actions, our most productive and best actions come when motivated. But how can we motivate when we don’t want to do something? Some reasons stem back to the habit loop. Immediate- (I think this is becoming even more prevalent in our current, instant gratification society-but that’s another topic altogether.) It’s hard to motivate toward a goal years away or that may never come. Culturally popular-it’s difficult to stand out from the crowd and do what others may not agree with or like. Not well understood-new, different or unknown can create a more difficult or unchartered motivational course. More effort is required to get ourselves ‘up’ or motivated in these instances. But we need to stand firm in our resolve to move forward with what we need to achieve our goals. Sometimes small, mini rewards along the way fuel motivation. The key to execution begins with motivation. Once we find it and stand firm, we need to move forward, no matter how difficult it may be. Habits are integral in this process. So, your execution habit to learn this month is simple: Just take one step at a time. That’s it. Try it. See if creating this habit helps motivate you toward your memory goals. When we pay attention to just one step at a time, our procrastination, excuses and dislike fade away as we find success and progress. 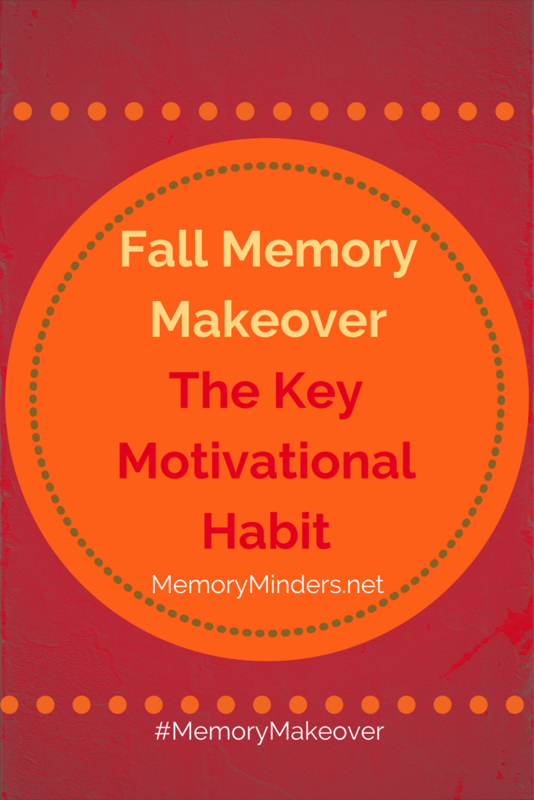 Let’s execute and move forward in our #MemoryMakeover goals today-one step at a time.